Everythingthat makes children happy comes from nature. Lots of freedom for our children. Farmer Pepi is calling: the stables await you. Thestable boiler suit and boots are ready to go. Are we going to saddle the ponies today?Are there still some eggs in the hen house? Children, the berries are ready for picking. The vegetable garden is great for nibbling. Truly delicious!!!! If only the garden snailcould talk.The yellow marigold is in flower, what can we do with it? 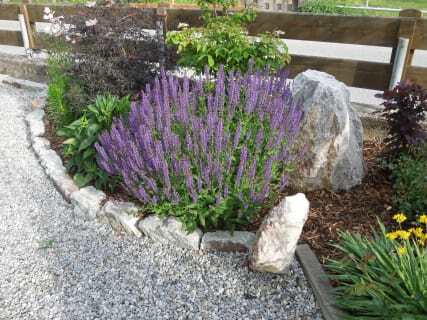 We can carefullypick the flowers and make tea with it - How would thattaste? Great - that'swhat granny used to do in the old days too. Relax under the massive apple tree and enjoy the panoramic views. Have a chat with farmer Pepi and his wife Marita. What are we going to do with so many apples?We process them in our farm distillery and make fruit brandy. But the apple juice is delicious too. Farmer Pepi explains how fruit brandy is made from apples and after that, we'll do some tasting together. Unwind in our new and cosy energising lounge - includes sauna and infra-red cubicle. The Pitztal Summer Card is included in all rates from June to mid-October and offers free rides on the cable cars, lifts and buses, free access to lakes and climbing parks and many more benefits. Skiing on Hochzeiger in Pitztal. In the morning, take a leisurely ride on the free ski bus to the valley station, pick up the ski and snowboarding equipment from our farm's own ski depot and let's go. 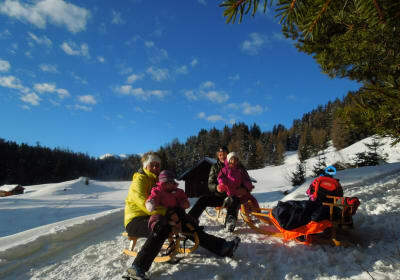 The ski instructors are already waiting for your children, and soon they'll be whizzing down the slopes. As a reward, they can go with farmer Pepi in the evening to feed and care for the animals in the barn. Farm: Two spacious, cosy and fully-equipped holiday apartments that each have two showers and two WCs, large lounge with children's play corner. Child facilities. Own schnapps distillery, we can gladly taste the creations together. Products produced on site: Eggs, potatoes, liqueurs, schnapps, jams, apple juice, herbal ointment. Weekly programme with the "PitztalerErlebnisbauern" (ski races, torchlit walks ......). Bread roll delivery service. Skiing; several ski areas nearby. It's 8 km to the Hochzeiger- Jerzens family ski resort, and a free ski bus goes there many times a day. Ski depot at the valley station for our guests. Toboggan rental at the farm, toboggan run in front of Albeinelerhof. 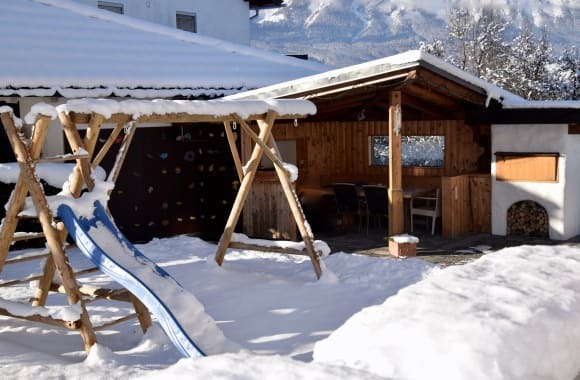 Children: Help out in the barn with farmer Pepi including barn clothes and boots, children's school at Hochzeiger, kindergarten with afternoon care, children under 10 years of age receive a free ski pass. Spa: New, comfortable spa area with sauna, organic sauna and infrared cubicle. Beautiful relaxation room with views of the mountains. 3 x weekly use included, you will receive sauna towels and bathrobes from us. A farm means hard, difficult work – but for our small guests this means animals galore, riding on the tractor with Pepi the farmer, working the land and endless freedom! Children have been attracted to farms since way back. Vacations are great when children are happy and at our farm children are allowed to be children! A Haflinger draft horse, two ponies, two miniature pony, two miniature sheeps, rabbits, guinea pigs, cat, chickens, and a rooster. 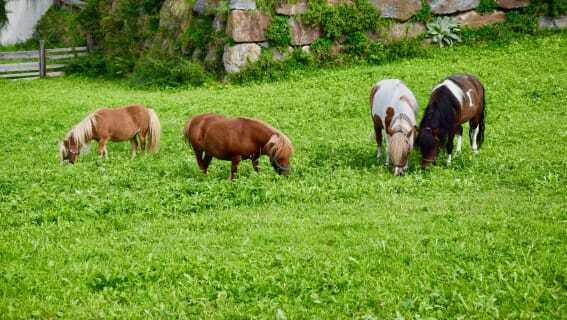 While our ponies Cindy and Nelly, along with the Haflinger Mayka, are favorites of both big and small children and love to be petted and groomed, our two miniature sheeps, rabbits, guinea pigs, cat and chickens also look forward to being spoiled! Let your children experience a part of the world which they may have never seen before – on our farm they will get their first real contact with nature. Let the morning sun wake you. And in the evenings you can enjoy the last sun rays on the balcony with a glass of wine - lovely. 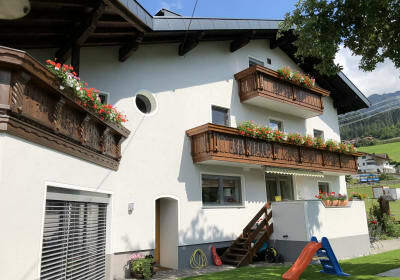 Holiday apartment "Sonnenblume" (sunflower) features a combined living/kitchen, 2 bedrooms, 2 showers and 2 WCs, the perfect holiday spot for large families or holidays with friends. Lovingly appointed with solid wood furniture made from local spruce. You'll find everything for making children happy. The holiday apartment "Königskerze" comes with panoramic views that will make you pause, enjoy and, simply put, happy. 2 bedrooms having solid spruce wood furniture, a shower and WC each. Here you will find restful sleep. The holiday apartment is spacious and everything to make children happy is available. Watch your children from the sunny terrace as they play in the garden.